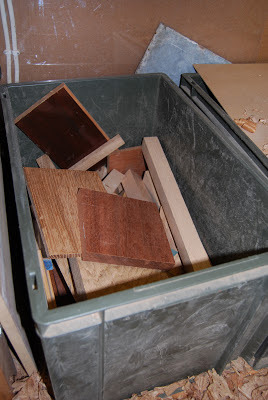 Naturally enough, I like wood...and for anyone who does a lot of work with the stuff, who doesn't? What I don't like...in fact I detest it, is throwing the stuff away, so I've developed a few devious strategies to organise the storage of 'the good stuff'. The first pic shows the bigger boards stacked on end and held in place with a couple of cords tightened with camping guy ropes...having a big lump fall out (and it has happened, frequently) and also where it unfailingly seems to launch itself at your head is guaranteed to cause some sucking of the teeth together with some very rapid foot shuffling. Some nice boards in there though...English Walnut (the big one near the ceiling) together with American Cherry, lots of Elm, Teak and English Oak. ...which contains all the bigger bits of 'exotics' that accumulate. African Blackwood, Teak, Indian Ebony, Cuban Mahogany, Purpleheart and one or two bits of Aussie burr timbers all live in here. Yet another box stores all my oddments of 'crap'...bits of mdf, small oddments of ply, which are useful at some point during a making process. Anything too small for the green boxes lives in a drawer under the bench. Stuff in here is usually small, maybe a bit longish and often a bit skinny, but always useful for all sorts of little jobs. ...is positioned under the pillar drill, this time specifically for bits of Elm. Storage for timber that's been roughly cut to condition is on yet another rack, just under the oil filled rad so there's a reasonable amount of heat there when it's on. 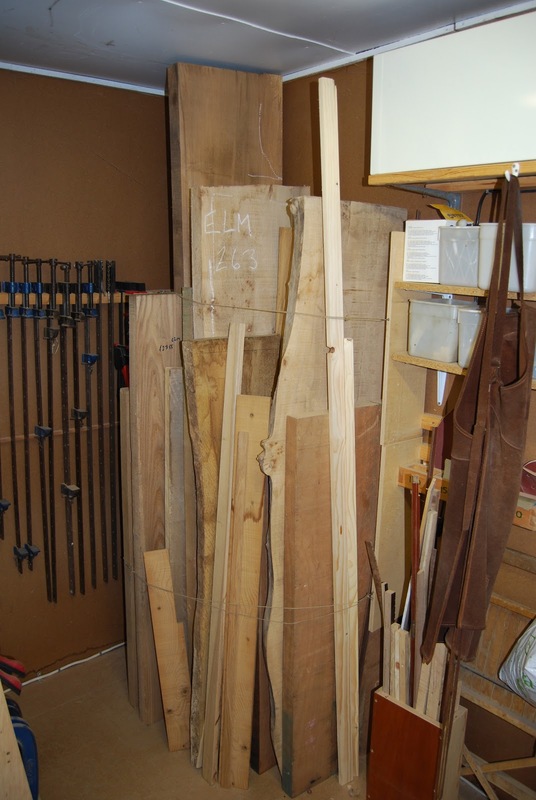 Shown on this rack are bits of English Walnut (top) recently cut for the new stand on the Double Square Cabinet, a large bundle of long thin bits of Oak for shoji lamp panels and one or two bits of Elm (bottom) which might form the basis of a cabinet later on. ...to another rack under the take-off table ready for use, as this will be the next project to be made. Shown here is a pile of English Oak for a wall hung cabinet with a thick board at the bottom which will be a curved door. A puzzle...and one that I've never been able to solve. No Matter how much you organise it it's still rubbish Rob. Why don't I pop round and take it all to the erm.. tip for you? I'm sure you would feel wonderful once relieved of such a great burden of unwanted clutter.